All the discs are inspected. *1: An archival life of more than 50 years in an environment of 25°C and 80% humidity has been estimated (using the Arrhenius Method) from accelerated age test results conducted by Panasonic. *2: Quality inspections for archival performance are conducted using actual disc drives. 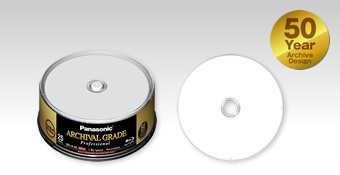 • Disks and package cases fully comply with the Green Procurement standard in Japan. • The capacity of Blu-ray™ Disc is expressed in units of 1GB=1 billion bytes, but the capacity is slightly below that after formatting, so that the actual amount area that can be used will be less. • Blu-ray Disc™ and Blu-ray™ are trademarks of Blu-ray Disc Association.